Dar's By Design Web Design and Domain Hosting: RETIRED! 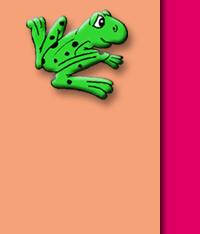 I still have a love of frogs, but have retired from web design and maintenance. Click Here Click on the frog to the left and download and unzip "Frog In A Blender"
How's this for being a frog lover?!?! One of our friends and visitors, Keith, sent us this photo of a computer he built for his wife, Sandra. We love it! And we are quite jealous!